And, while Windows 7 is a decade old at this point – launching on July 22, 2009 – it’s still incredibly popular, with recent reports from Netmarketshare suggesting that Windows 7 is still being used on 39% of all PCs. So, the company is releasing an update to Windows 7 - KB4493132 - which will display notifications reminding Windows 7 users to upgrade to Windows 10 before the End of Life date. The update is optional, but anyone with automatic updates turned on will receive it. Microsoft promises that the notification won't be too obtrusive, and you can prevent it from appearing again, but it shows how seriously Microsoft is about getting people to stop using Windows 7. So, read on for our advice on how to prepare for Windows 7's End of Life on January 14, 2020. So, if you still use Windows 7, what should you do? There are a number of things we’d recommend you do in preparation for Windows 7 End of Life, and the first is to consider upgrading to a newer operating system. Check out our pick of the best laptops for inspiration and buying advice on getting a new machine, whatever your budget. The most cost-effective way of preparing for Windows 7 End of Life is to switch operating systems altogether, and install Linux on your machine. Linux is an open-source operating system that’s completely free to use. It’s also regularly updated by a community of enthusiastic developers, so you can use it safe in the knowledge that it has new security patches applied to protect you from the latest threats. There are a huge number of versions of Linux available, which are known as distributions or distros. While this wide range of distros can be overwhelming at first, it also means it’s easy to find a distro that’s right for your needs. To help you get started, check out our guide to the best Linux distros. One of the most popular distros is Ubuntu, and it’s ideal for people who are moving from Windows to Linux, as it's easy to use and is supported by a lot of apps. Another excellent option we’d recommend is Linux Mint. This uses a similar user interface to Windows 7, so you won’t find the transition too difficult, and most of the tools you need are included when you install it. Another good thing about switching to Linux is that there are a number of distros that are specifically designed to run on older hardware. These distros can give your hardware a new lease of life, allowing it to run better than ever. Check out our pick of the best lightweight Linux distros. Some Linux distros can also be run off a CD or DVD – known as a live CD – which means they don’t need to be installed. This is also a good way of trying out a Linux distro before you commit to it. There are downsides, though. First of all, as Linux is a completely different operating system to Windows 7, it means that some of your favorite apps, such as Microsoft Word, won’t be available. The good news is that thanks to Linux’s popularity, many popular free programs are available for the operating system. And if a particular program isn't available, there's also usually a free and open source alternative that does the job just as well, if not better – for example LibreOffice is a popular open source alternative to Microsoft Office. If there’s a Windows-only program that you can’t live without, and there’s no viable alternative, you can consider using WINE, a tool that allows most Windows programs to run in Linux. No matter which distro you go for, there’s no denying that Linux is quite different to Windows in a number of ways, and that can create a bit of a culture shock. If you do go from Windows 7 to Linux you’ll need to spend some time learning how to use the new operating system – and that’s why it’s best to start looking now, rather than waiting until Windows 7’s End of Life deadline. Also, while there are many professional-looking distros (check out Elementary OS for an example of how classy Linux can look), there are also some that aren’t quite as polished as Windows. Check out our pick of the best Macs and MacBooks if you’re thinking of making the switch. If you're moving to Linux or a Mac device, or to a new Windows 10 machine, you’re going to be either formatting your hard drive or moving to new hardware, so you’ll want to back up your data so that you can transfer it your new device/operating system. If you run a business that still uses Windows 7, then you have a dilemma. Upgrading all your PCs to Windows 10, and retraining staff, might prove tricky before Windows 7's End of Life on January 14 2020. However, you don't want to risk running an operating system that doesn't get security patches. 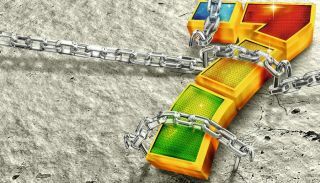 The good news is that Microsoft will be offering Windows 7 Extended Security Updates, which will continue to deliver updates and patches for Windows 7 business users after January 2020. However, these extended security updates will cost money on a per device basis, and it's now been revealed just how much these Windows 7 extended security updates will cost. For support for Windows Enterprise users using Windows 7 for the first year after the End of Life date (January 2020 – January 2021), the cost is $25 (around £20, AU$35).